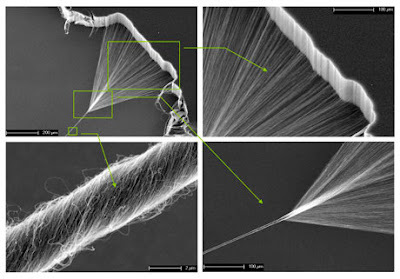 Nanotechnology is extremely diverse, ranging from novel extensions of conventional device physics, to completely new approaches based upon molecular self-assembly, to developing new materials with dimensions on the nanoscale, even to speculation on whether we can directly control matter on the atomic scale. 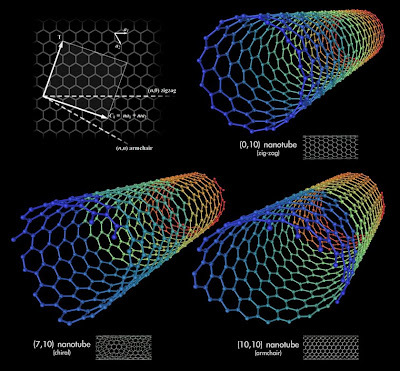 Carbon nanotubes are allotropes of carbon with a nanostructure that can have a length-to-diameter ratio of up to 28,000,000:1, which is significantly larger than any other material. These cylindrical carbon molecules have novel properties that make them potentially useful in many applications in nanotechnology, electronics, optics and other fields of materials science, as well as potential uses in architectural fields. They exhibit extraordinary strength and unique electrical properties, and are efficient conductors of heat.